Tropical storm “Doksuri”, which is now over the upper South China Sea, is likely to bring rain, with torrential downpours, to the Northeast and the North on Sept 15-16, according to the Thai Meteorological Department’s forecast at 11am on Wednesday (Sept 13). The storm, with maximum sustained winds of about 75 knots, is moving in the westerly direction at the speed of 15 kilometres per hour. 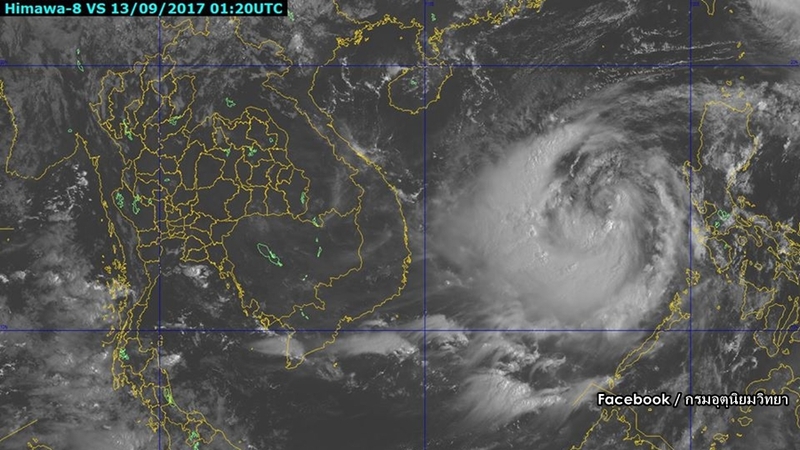 It is forecast to move past Hai Nan, China, and make a landfall over upper Vietnam by Friday (Sept 15). As a result, there will be more rain, with torrential downpours, in the Northeast and the North on Friday and Saturday. People are advised to stay tuned for the weather update. As the southwest monsoon across the Andaman Sea and the South will intensify during Sept 14-18, there will be more rain and isolated heavy rain in the South and the East during that period. The winds in the Andaman Sea and the Gulf of Thailand will become stronger and the waves will be 2-3 metres high. All vessels should proceed with caution and small boats should stay ashore, the department said in its announcement.